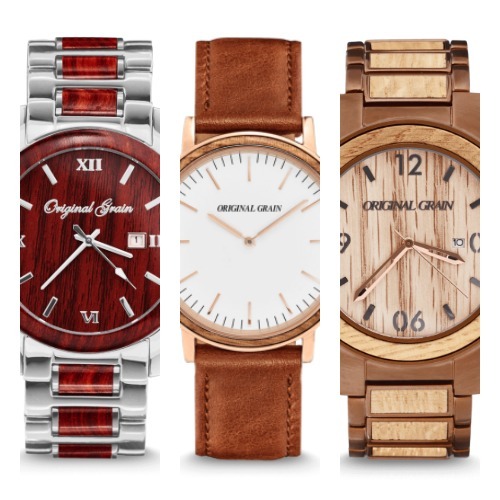 Original Grain Watches Review – Are They Good? Hello everyone, today I’m doing an Original Grain watches review. In the past, I’ve actually featured a couple of their watches for hands on reviews although I’m unable to find those articles right now so I may have to write some new ones soon. For now though, I wanted to do a brand overview of Original Grain watches and showcase 5 of their top watches from the various collections they have available. So how did Original Grain watches begin? Back in 2013 Original Grain was founded by brother Ryan and Andrew Beltran. They wanted to create unique watches that integrated natural wood and stainless steel, something that simply didn’t exist before. 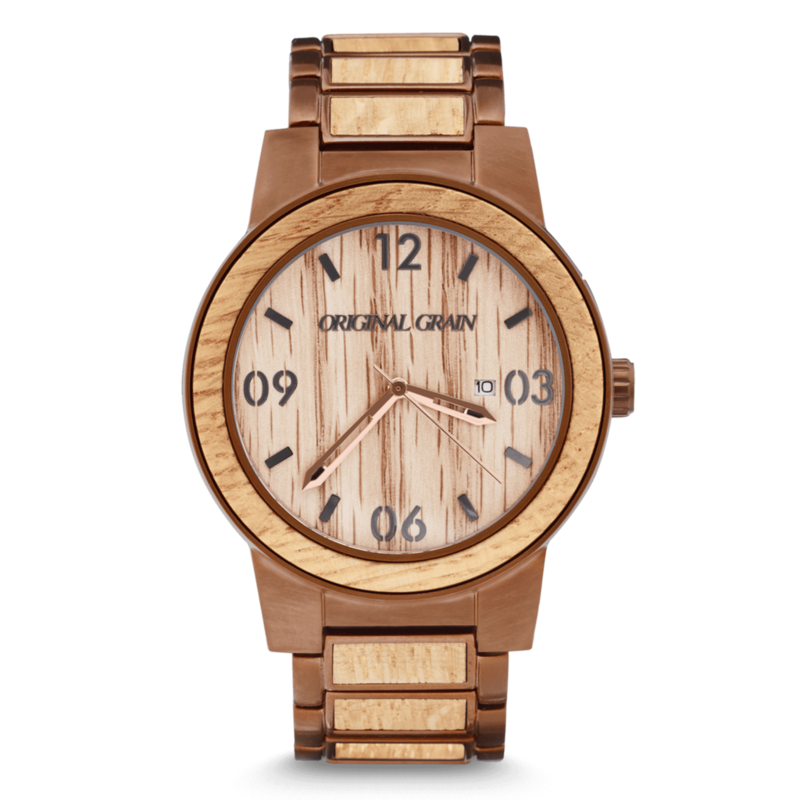 Although these days you can find other brands of wooden watches like Wewood watches, Original Grain remains one of the leading brands in this sector. I love it when a watch brand does something to give back to communities or help the environment. Original Grain has partnered with Trees For The Future in Senegal, this means for every watch sold they will plant trees, alleviate hunger and reduce poverty in Senegal. You can read all about this partnership and how they’re improving the lives of these people on the Trees for the future information page here. Are Original Grain Watches Any Good? So are Original Grain watches actually any good? That’s what many people really want to know. Luckily I have the pleasure of having two of their watches right in front of me. One with a leather strap, the other with a stainless steel and wooden bracelet. From my personal experience, I’ve been very pleased with my two Original Grain watches. They’ve run really well and I just love the design and overall look of them. It’s something that’s a bit different than my normal watches, so they get noticed when I’m wearing them. Considering what goes into these watches I’m actually quite pleased with the overall value for money. This can always be a touchy subject for some, I’m someone who likes the look and style of a watch whilst still taking into consideration the parts, some watch snobs might disagree with me though. 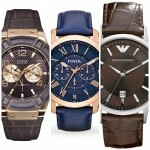 Below I’ve featured 5 of the top watches from Original Grain’s various collections. If you have any questions about any of the watches featured here just comment below and I’ll try and help you out as soon as I can. For now, enjoy today’s list. 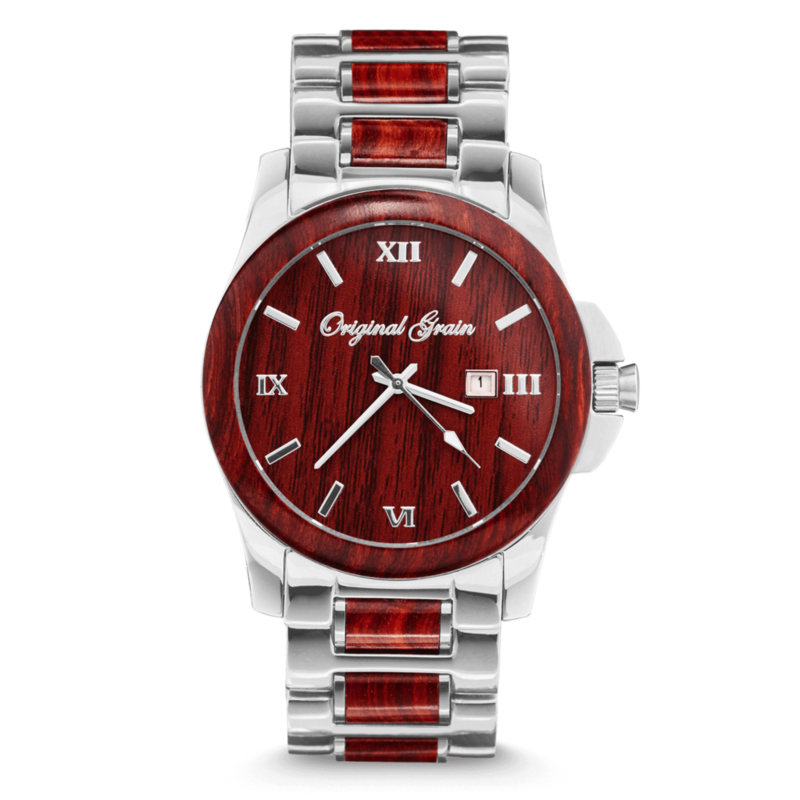 First up in our look at some of the best Original Grain watches available is the ‘Original Grain Rosewood’ from the Classic collection. This men’s watch is built with a 43mm stainless steel casing that features a 3.5mm rosewood bezel inlay. The thickness of this casing is 11mm. The strap is also made of stainless steel with rosewood elements and fastens with a push release clasp. I love the colouring of the dial with the natural Rosewood design that’s been coupled with silver coloured hands and hour markers. There’s even a handy date function at the 3 o’clock position. Powering this men’s Original Grain Rosewood watch is a Japanese Miyota quartz movement for reliable and accurate timekeeping. The glass is made of a specially hardened mineral crystal for a good level of scratch and shatter resistance. You can read my full The Classic Rosewood Original Grain watches review here soon. Next up we have one of my favourite Original Grain watches. This is the Whiskey / Espresso from The Barrel collection. 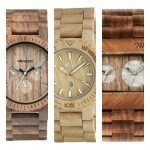 These timepieces are made from reclaimed American oak whiskey barrel wood. It’s a larger timepiece with a 47mm brushed espresso stainless steel casing that has a thickness of 12mm. The wooden bezel inlay on this model is 4mm. The strap of the watch is made of the same brushed espresso stainless steel with reclaimed wood elements. It fastens with a push release clasp. Again I really like the natural look that you get with these wood dials. The rose gold tinted hands work very well and compliment the wooden background nicely. Just like the previous watch, this model also has a small date display at the 3 o’clock position. At the heart of this wooden watch is a Japanese Miyota quartz movement that gives you reliable and accurate timekeeping. A mineral crystal glass gives you a decent level of scratch and shatter resistance too. This model also has a basic water resistance rating. You can read my full The Barrel Whiskey / Espresso Original Grain watch review here soon. 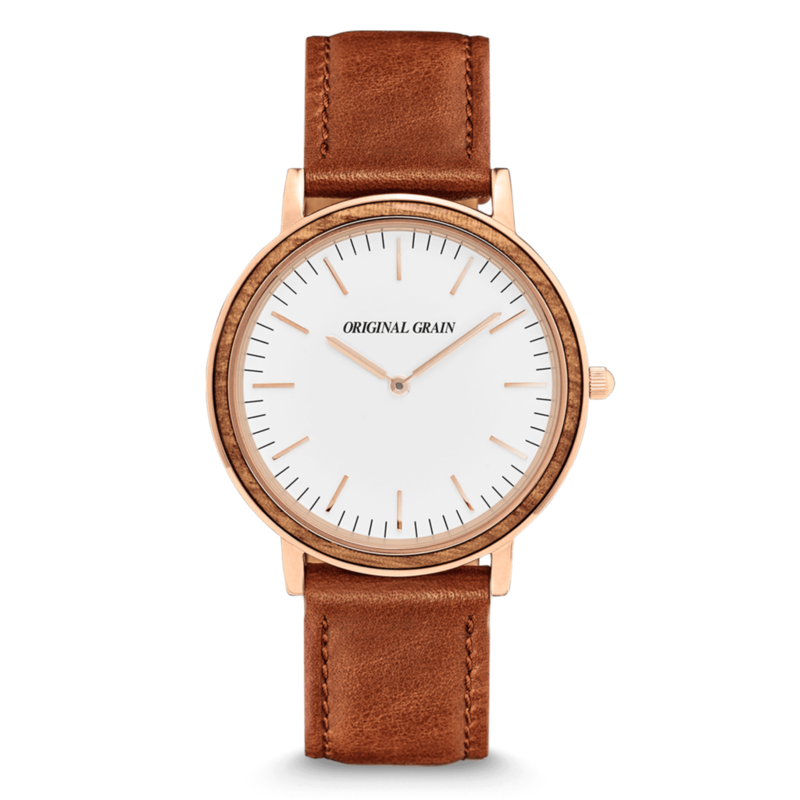 Here we have a popular simplistic watch from Original Grain. This is the Zebrawood / Rosegold which is part of the minimalist watches collection. This timepiece features a 40mm stainless steel casing that has a PVD rose gold plating. The bezel has a Zebrawood 1.7mm inlay that works beautifully with the rose gold colouring. The depth of the casing is just 6mm making it very slim, a popular trait of minimalist watches. This has been paired up with a soft genuine leather strap that fastens with a buckle style clasp. The dial is finished in a soft egg-shell white colour with slim styled rose tinted hands and baton hour markers. It’s simple and easy to read which again are popular traits for a minimalistic watch. This Original Grain watch is powered by a Japanese Miyota quartz movement that’s known for being accurate and reliable. The mineral crystal glass on the front of the watch has been specially hardened to offer a higher level of scratch and shatter resistance. This model also comes with a basic water resistant casing. You can read my full Minimalist Zebrawood / Rosegold Original Grain watches review here soon. In at number 4 we have this stunning chronograph wooden watch from Original Grain. 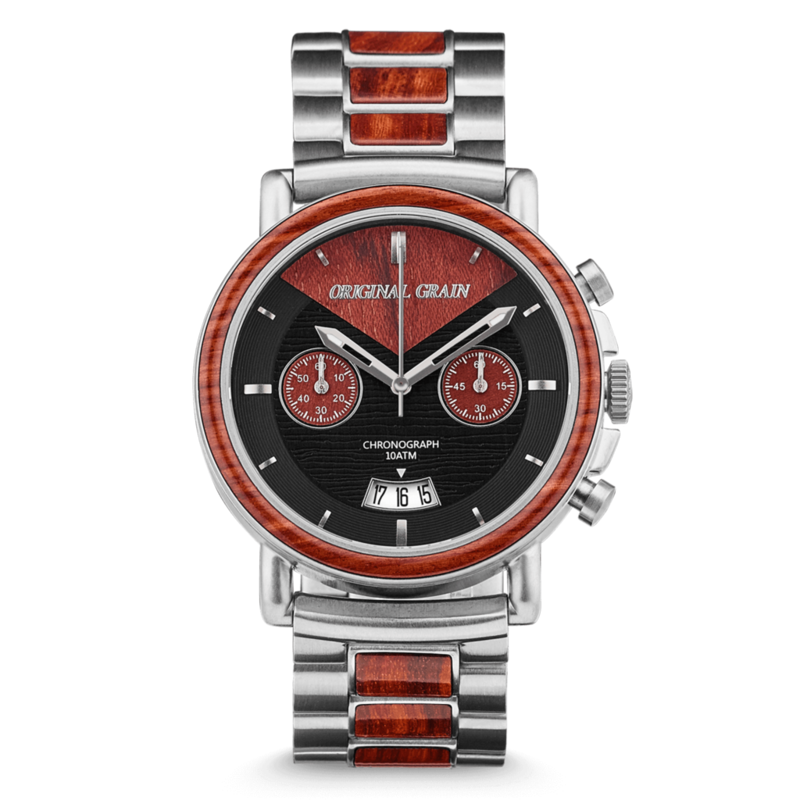 This model is from the Alterra Chronograph collection and is the Rosewood / Silver edition. This is a higher end model and is a little more pricey than the previous watches featured. It’s built with a 44mm stainless steel casing that has a thickness of 11mm. There’s a 2.5mm rosewood bezel inlay that matches up with the strap. The strap is also made of stainless steel with rosewood elements and fastens with a push release style clasp. This popular Original Grain watch has this lovely chronograph dial design with the sub dials displaying a 60 second stopwatch and a one hour timer. I’m a fan of these larger exposed date functions as I feel they stand out nicely. At the heart of this men’s wooden watch is a 5-hand Japanese made quartz chronograph movement for reliable and accurate timekeeping. Protecting the front of the watch is a sapphire crystal glass which has an extremely high level of scratch resistance. 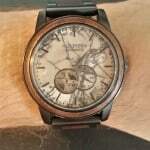 You can read my full Alterra Chronograph Rosewood / Silver Original Grain watches review here soon. Last up on our list of the best Original Grain watches is this second timepiece from the minimalist collection. This is the Ebony / Matte Black watch that’s built with a 40mm matte black stainless steel casing that has a thickness of just 6mm. The 1.7mm wooden bezel inlay is made of ebony wood. 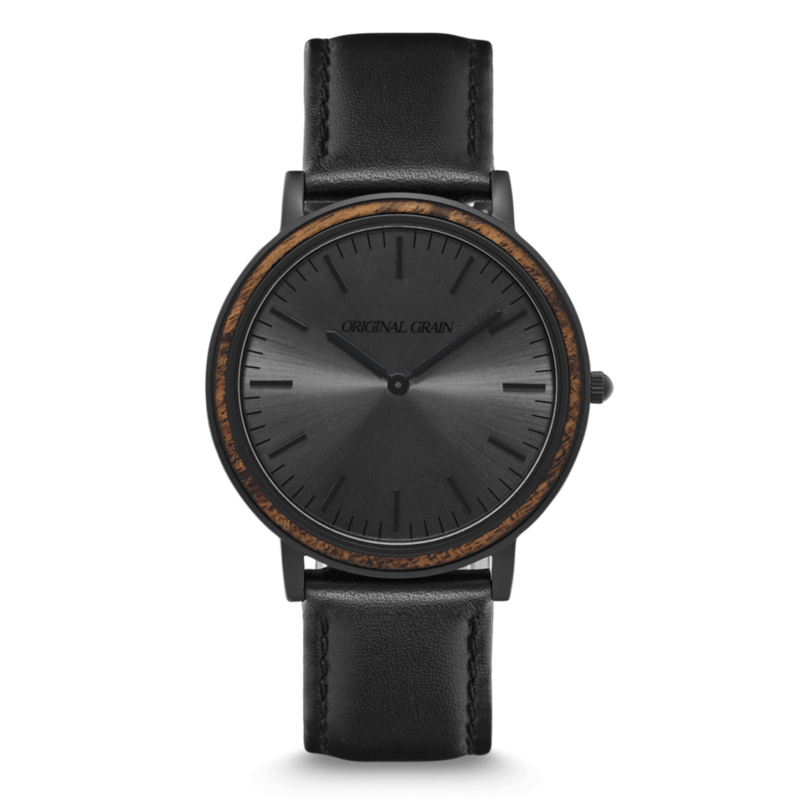 The dial features this black sunburst design with slim black baton style hour markers and hands. It’s fair to say it could be a little hard to read in dark conditions but that’s a common issue with black watches. Powering this minimalist watch is an accurate and reliable Japanese Miyota quartz movement. A mineral crystal glass has been specially hardened to offer you a good level of scratch and shatter resistance. It also has a basic water resistant casing. You can read my full Minimalist Collection Ebony / Silver Original Grain watches review here soon. Thanks for taking the time to read through today’s Original Grain watches review. What was your favourite model featured today? Comment below and let us know.